A midfield masterclass helped 10-man Glenavon grab derby glory at Dungannon Swifts with an assured 3-0 victory. 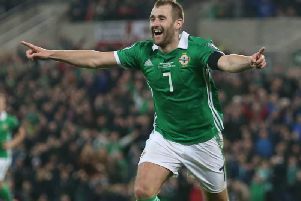 Former Northern Ireland international Sammy Clingan steered home double set-piece success across the second half with a composed penalty and curling free-kick finish. Glenavon took the lead off a Mark Sykes strike and suffered a sole setback with James Singleton’s red card. Andrew Mitchell - back at the Stangmore Park setting which proved so central to his development - chased down Chris Hegarty to win back possession for Glenavon early on then linked up with Sykes and whipped over a low cross. Marc Griffin raced in to meet the ball on the run but could only steer his sidefoot at pace the wrong side of the upright. Jarlath O’Rourke had to step in to restrict the threat following one driving run from deep by Sykes. However, moments later, it was success for Sykes in similar circumstances to break the deadlock on 20 minutes. Jonny Tuffey’s upfield punt secured Glenavon a throw-in and a delivery by Rhys Marshall was guided towards the goal off Mitchell. Sykes burst forward from outside the area into the box and capped his run with a right-foot hooked shot into the corner. Glenavon came close to a second goal within moments when Clingan’s free-kick was flicked towards the home goal by a Swifts player but it bounced off the face of the crossbar. The Swifts struggled to add a cutting edge to some positive forward play but tested Tuffey from distance off Grant Hutchinson’s low drive. Glenavon enjoyed the perfect start to the second half by increasing the advantage to 2-0 with just two minutes played after the interval. Liam McMenamin was adjudged to have bundled over Bobby Burns in the box by referee Raymond Hetherington - with Clingan keeping his back to Stuart Addis until the match official’s whistle, then stepping up to slot home. The Swifts’ hopes of a fightback received a boost when Singleton was sent off on 63 minutes for a second bookable offence. However, Clingan stepped up to effectively secure full points from the derby date with a superb free-kick beyond Addis’ dive to the right. DUNGANNON SWIFTS: Addis, Hegarty, Wilson (Lowe, 57), Armstrong, McMahon (Burke, 54), Mayse, McElroy, O’Rourke, McMenamin, Hutchinson (Harpur, 57), Lafferty. Subs (not used): Teggart, Clucas. GLENAVON: Tuffey, Burns, Doyle, Marshall, Mitchell (Jenkins, 85), Griffin (McGrory, 64), Sykes, Marron, Clingan, Foley (Daniels, 46), Singleton. Subs (not used): Norton, Lindsay.